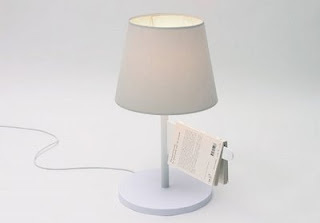 From Fulgoro comes this concept for a bedside-table accessory that serves as a dual-purpose reading companion: the lamp illuminates your reading, and the arm acts as a bookmark. It's easy to appreciate the simplicity of both the form and the function of this concept - it's the bare minimum, but you can tell it gets the job done. Now if it could save my place when I fall asleep reading, it'd be even better!